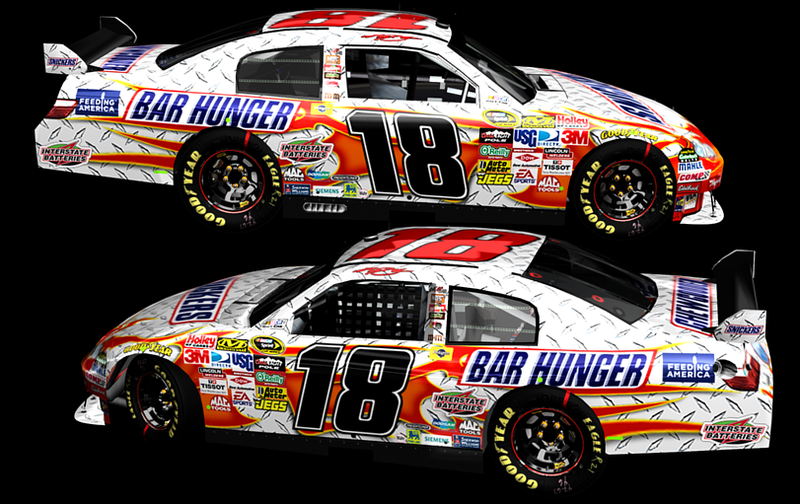 THIS CAR WAS SUPPOSED TO BE DRIVEN AT HOMESTEAD-MIAMI SPEEDWAY. 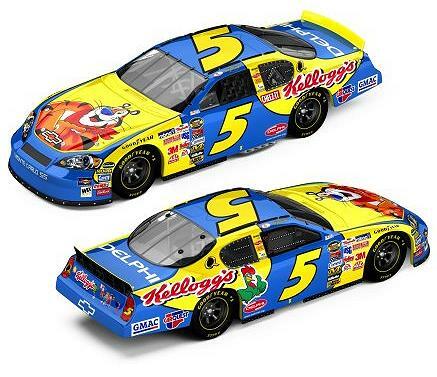 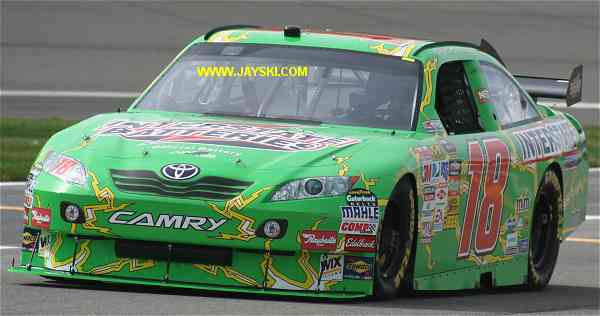 HOWEVER, NASCAR CONFISCATED THIS RACECAR, BECAUSE IT DID NOT MEET THE SANCTIONING BODY'S TEMPLATE RULES. 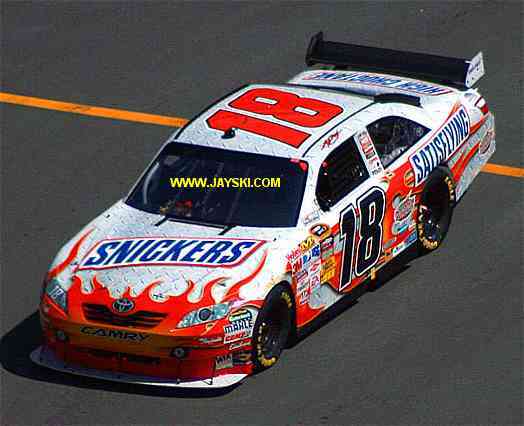 IF ANY ONE HAS A PICTURE OF THIS RACECAR THEN PLEASE E-MAIL ME! 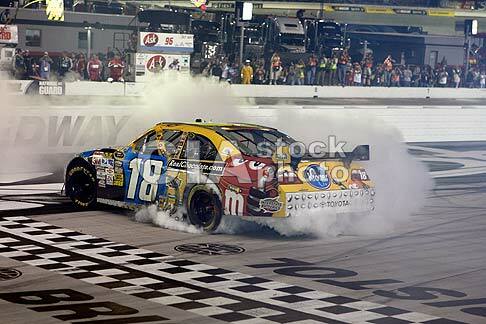 RAN AT CALIFORNIA, BRISTOL, LOWE'S MOTOR SPEEDWAY, KANSAS, AND TEXAS. 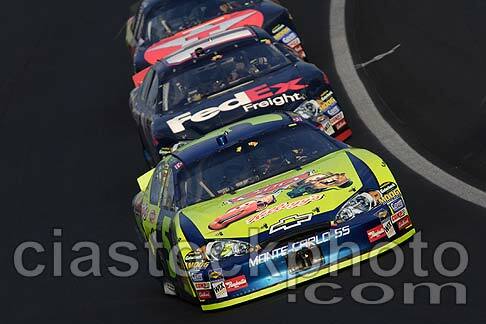 RAN AT TEXAS, INDIANAPOLIS, RICHMOND, AND CHARLOTTE. 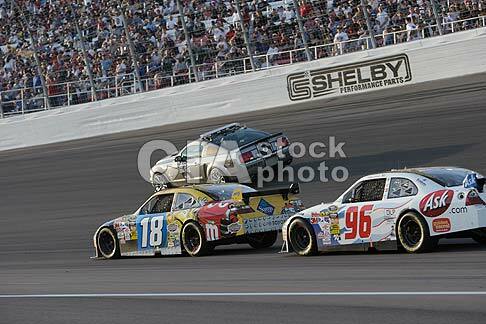 RAN IN THE BUD SHOOTOUT. 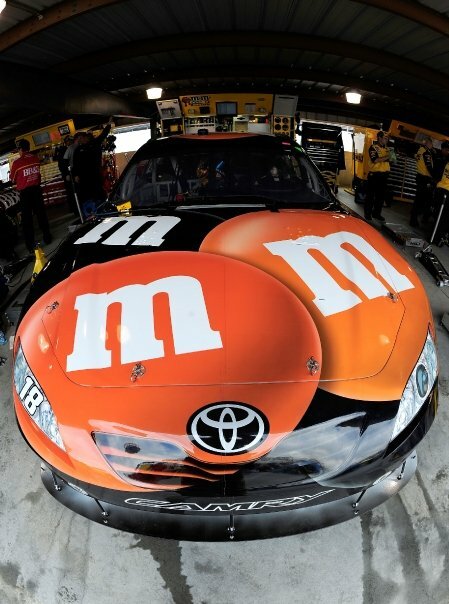 THIS CAR HAS THE MyFi LOGO ON IT. 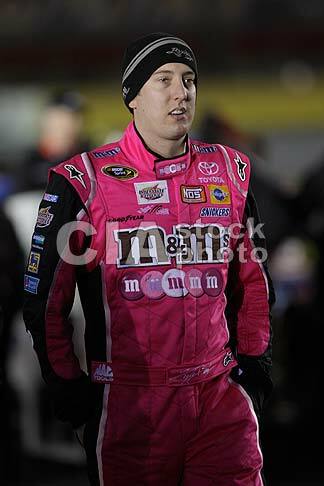 RAN AT TEXAS, INDY, MICHIGAN, AND CHARLOTTE in OCTOBER. 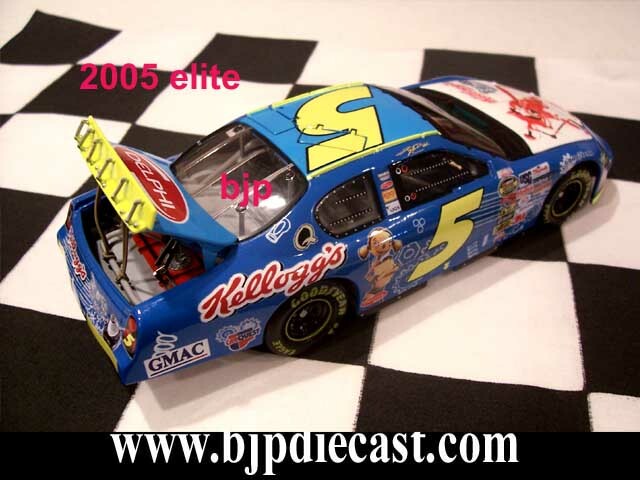 IF ANY ONE HAS A BETTER PICTURE OF THE ABOVE RACECAR, THEN PLEASE E-MAIL ME! 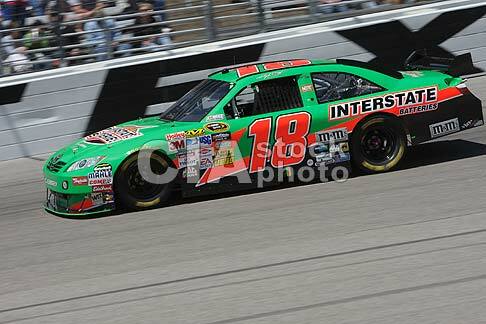 RAN at both Pocono races, Chicago and Texas in November. 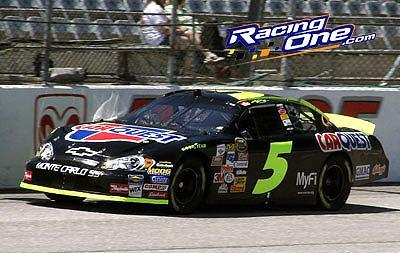 RAN at DAYTONA IN THE JULY RACE. 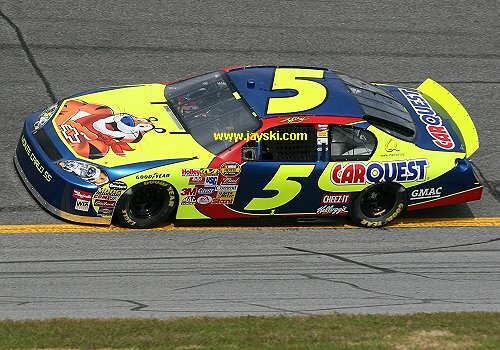 If any one has a better picture of this racecar then please E-MAIL ME! 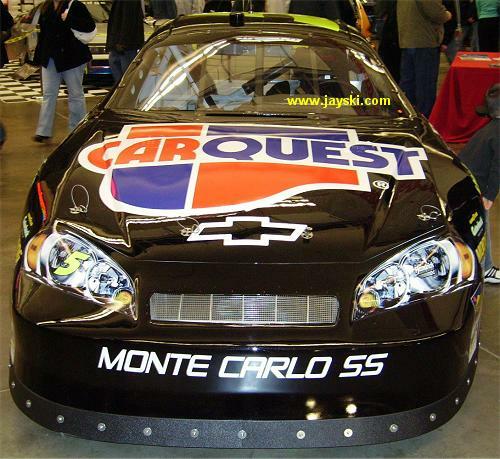 (THE BACK END PICTURED ABOVE WAS USED IN A FEW RACES IN 2008). 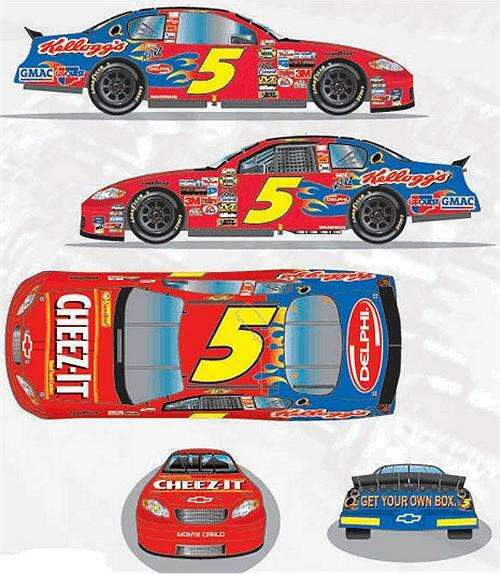 This car ran at California, Texas, New Hampshire, Daytona, Michigan, and Dover. 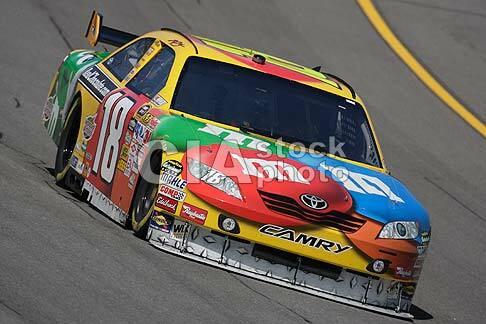 This car ran at Atlanta, and Phoenix. 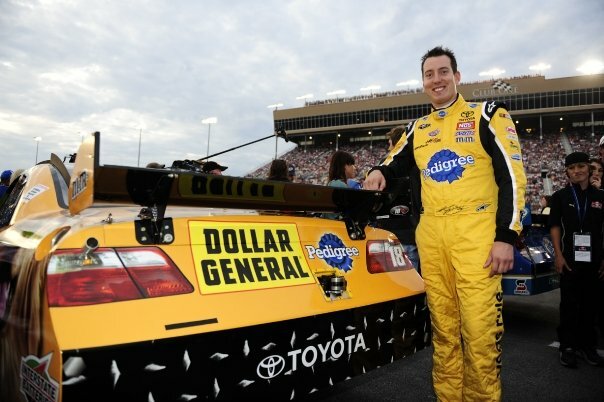 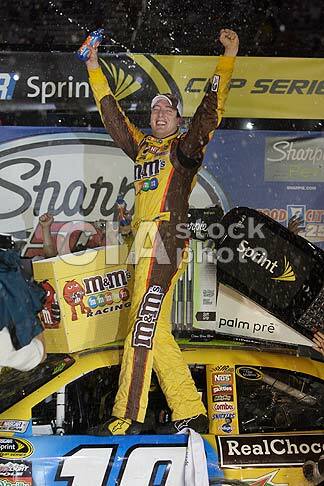 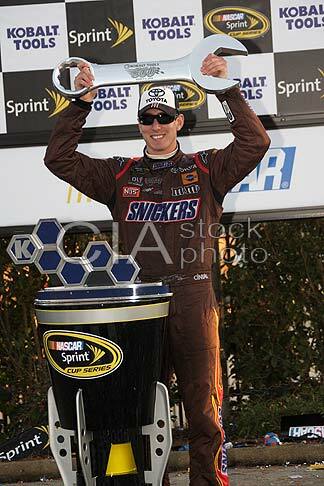 KYLE BUSCH IN VICTORY LANE AFTER WINNING IN HIS SNICKERS TOYOTA AT ATLANTA. 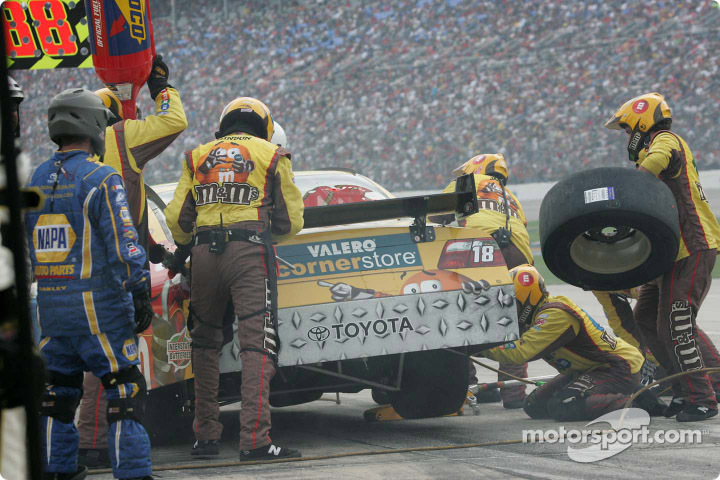 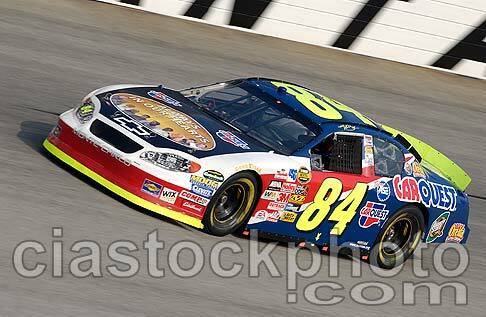 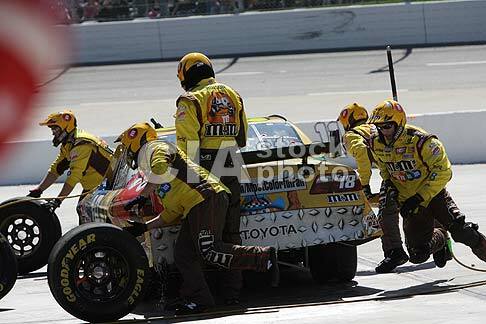 This car ran at Richmond, Bristol, and Phoenix. 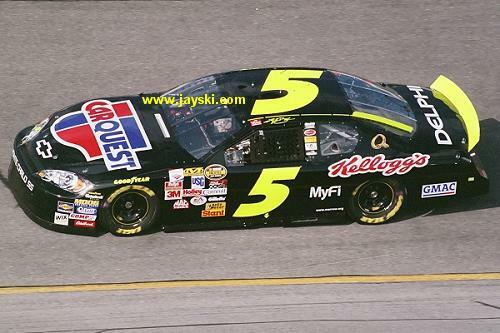 This car ran at Darlington. 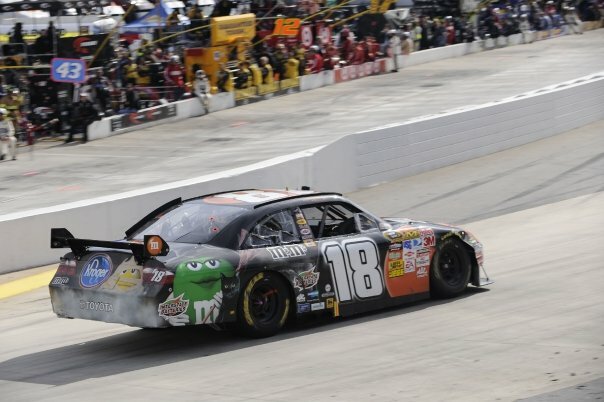 This car ran at Dover. 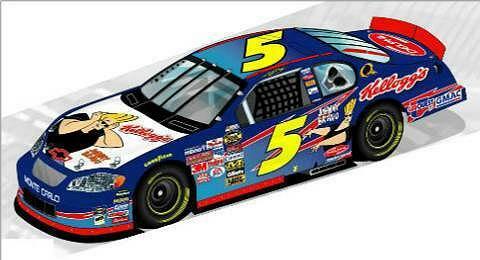 (THIS CAR WAS TO CELEBRATE THE 4th OF JULY). 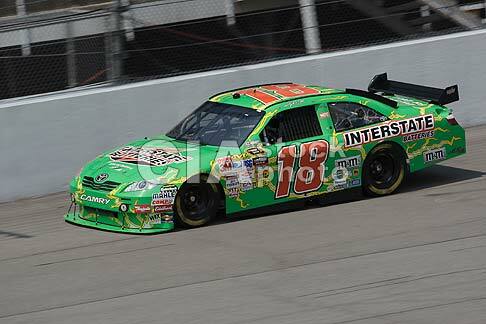 This car ran at Indy. 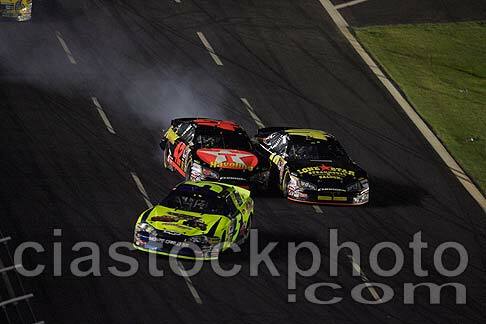 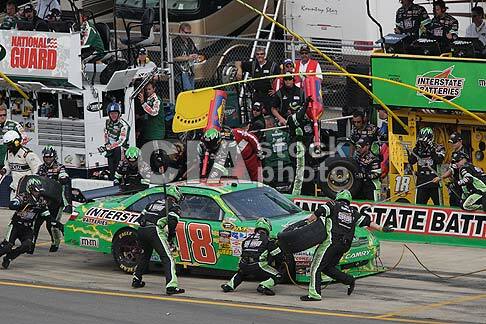 This car ran at Charlotte. 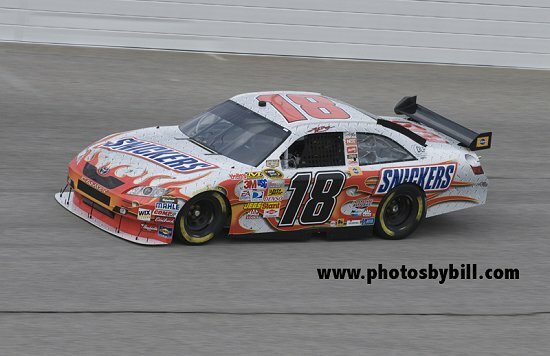 This car ran at Atlanta. 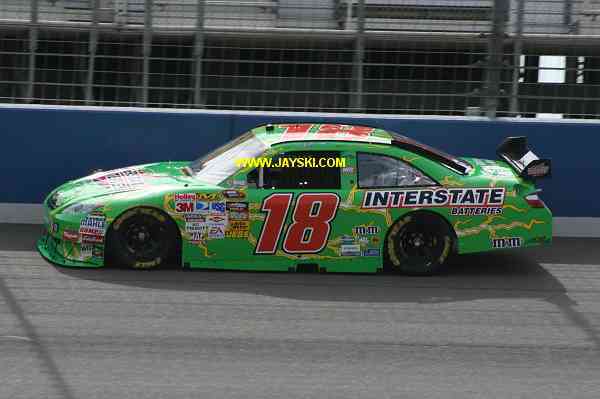 This car ran at Fontana. 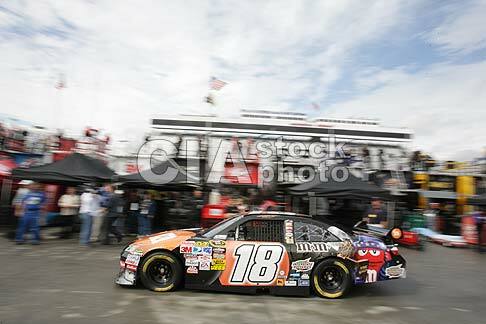 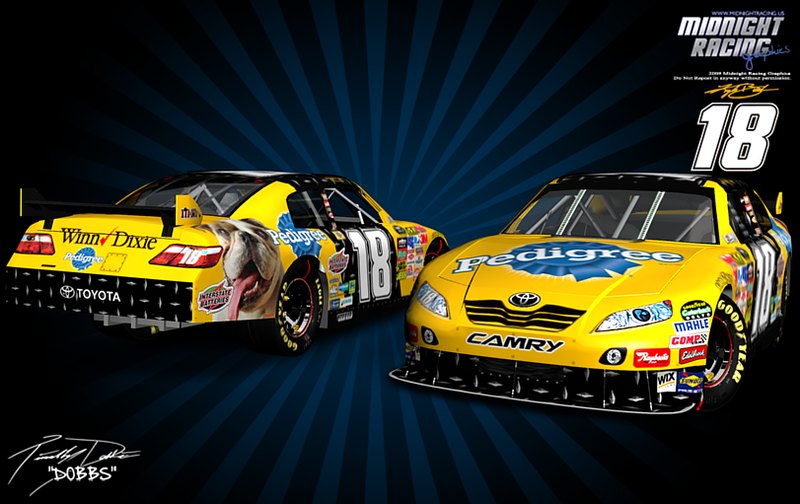 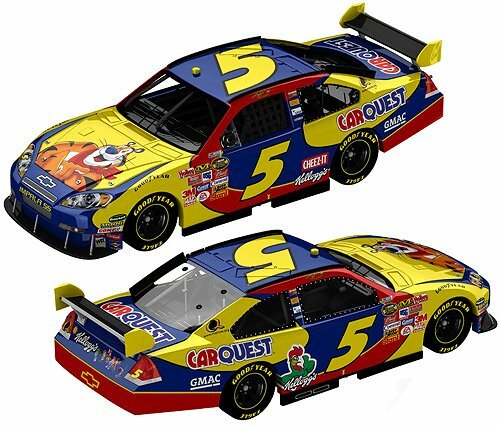 On the picture on the left it shows that Sams' club is on the back of the racecar. 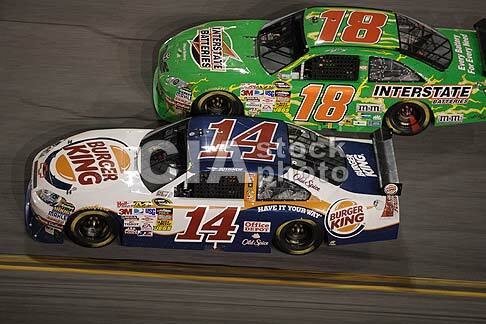 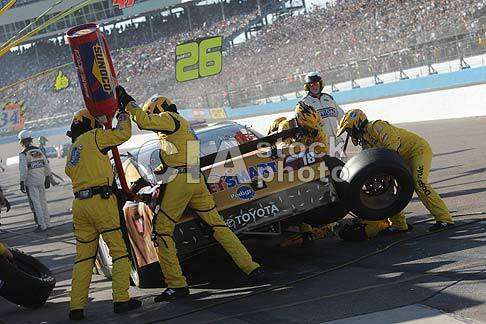 second Loudon races, and the second Talladega races. 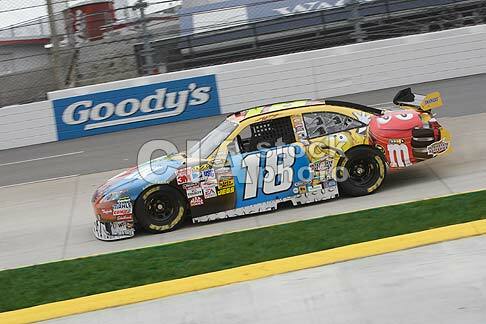 This car ran at Bristol. 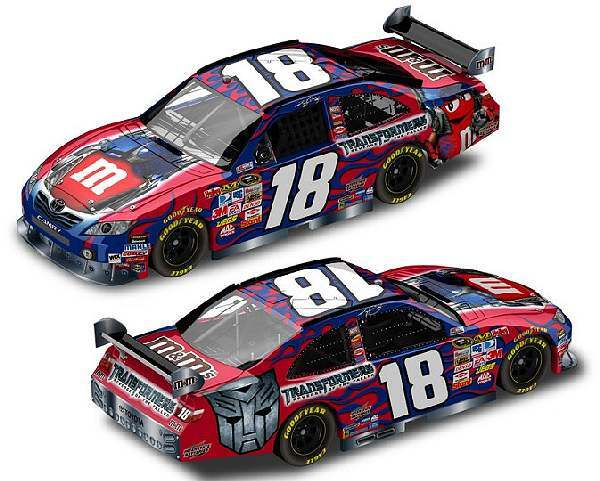 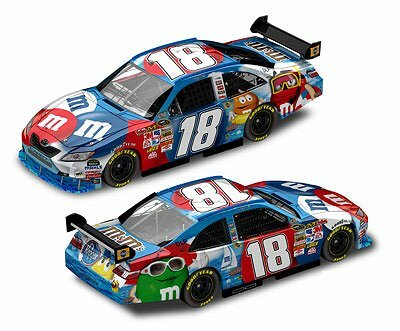 The difference of this paint scheme is the back of the car. 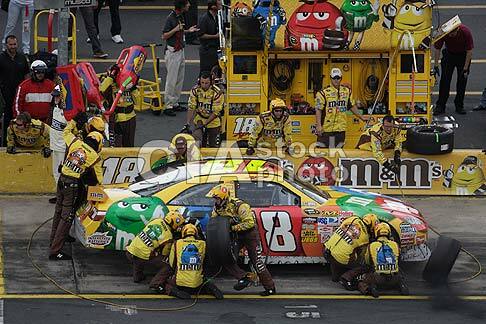 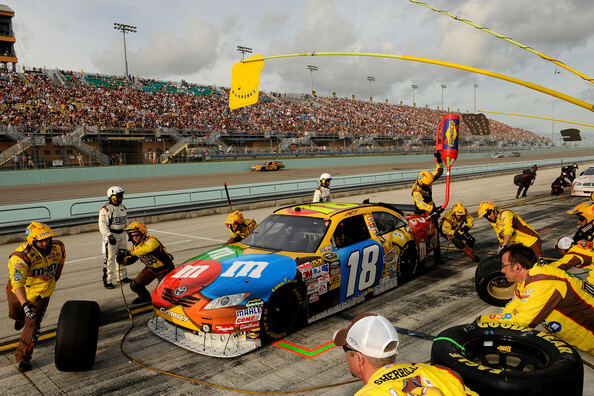 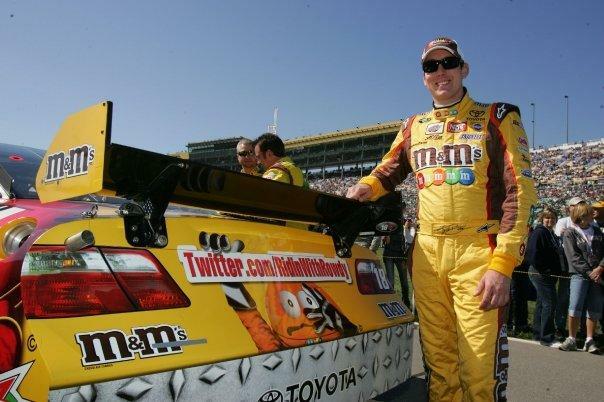 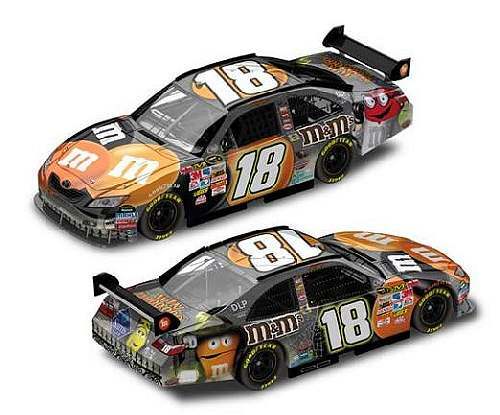 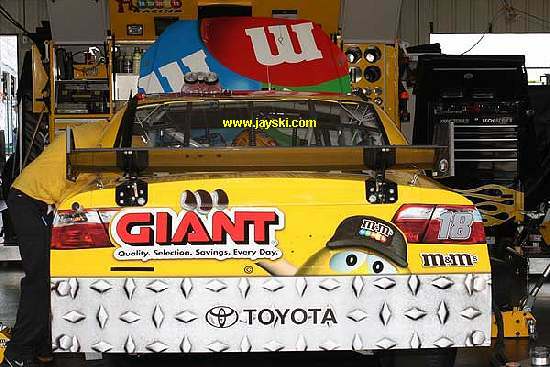 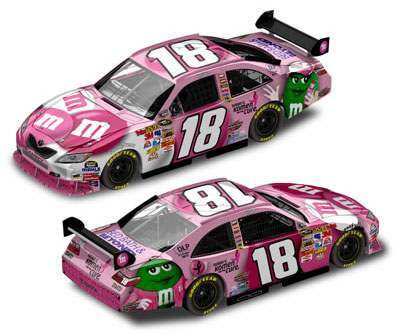 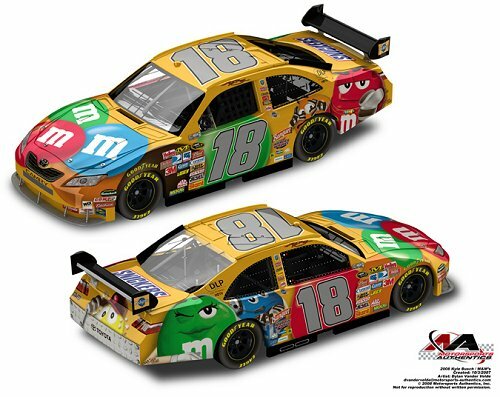 It was a promotion that M&M's ran trying to find Kyle's most colorful fan. 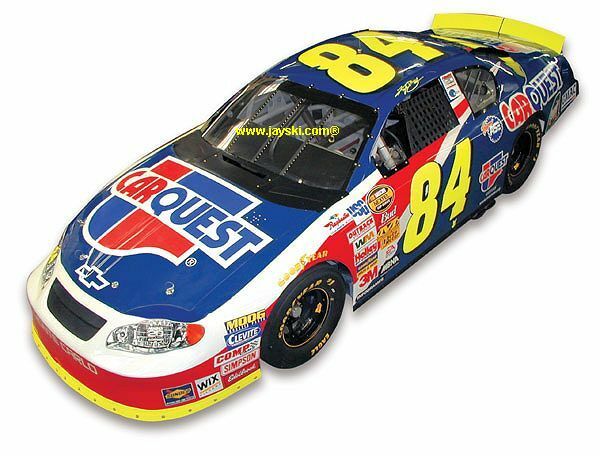 This car ran at the first Martinsville races. 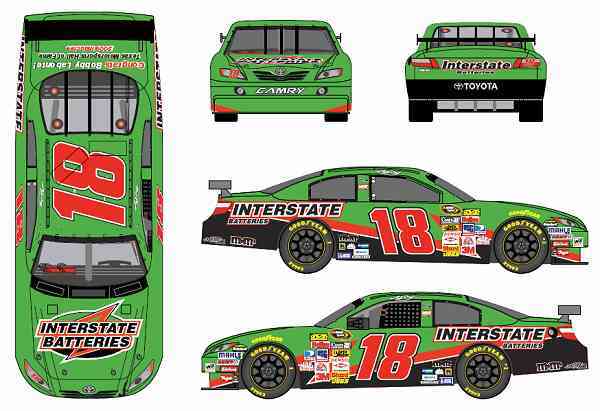 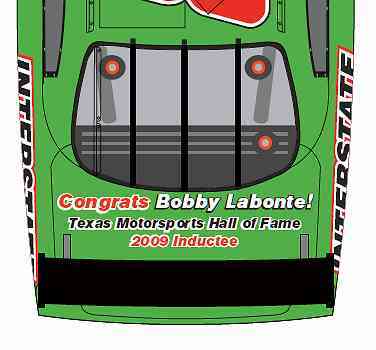 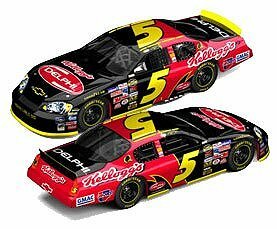 Kyle raced this car in honor of Bobby Labonte getting into the Texas Hall of Fame. 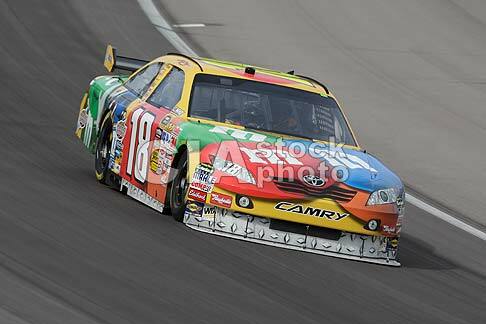 This car ran at Fort Worth, Texas. 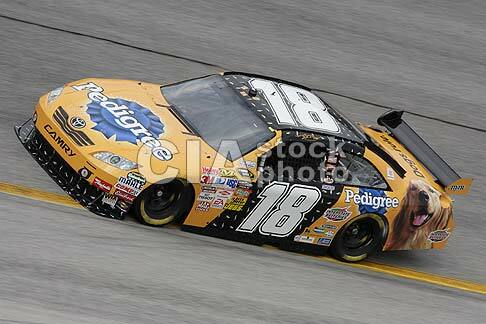 This car was raced at the first Talladega race. 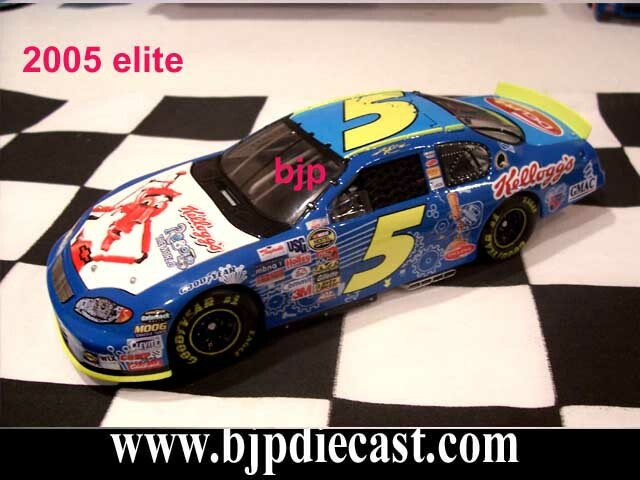 This car was raced at the first Richmond race. 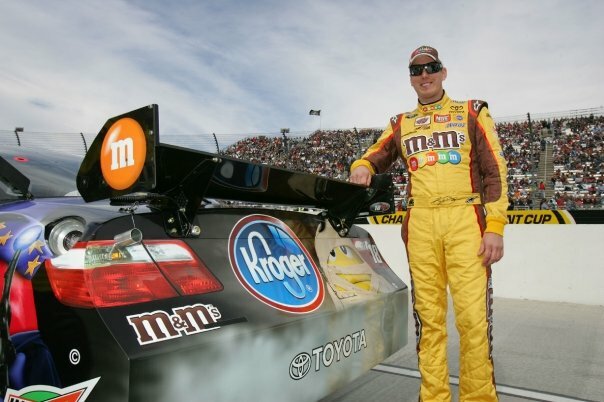 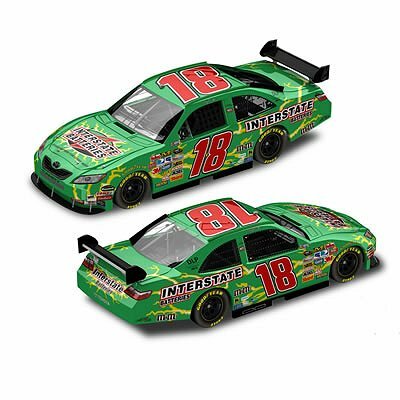 The difference of this paint scheme is spoiler, and the trunk of the car. 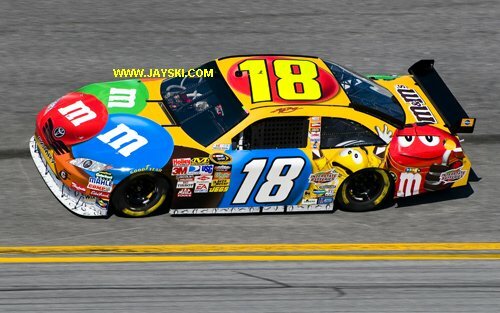 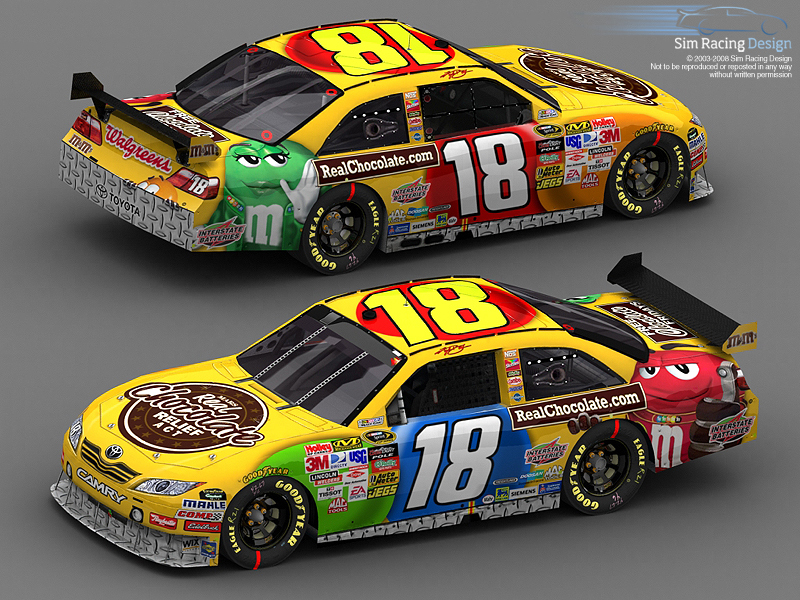 The spoiler says M&M's while the spoler is the real choclate logo. 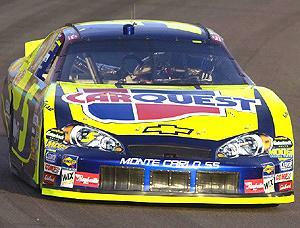 This car ran at the first Charlotte, first Dover, and first Pocono races. 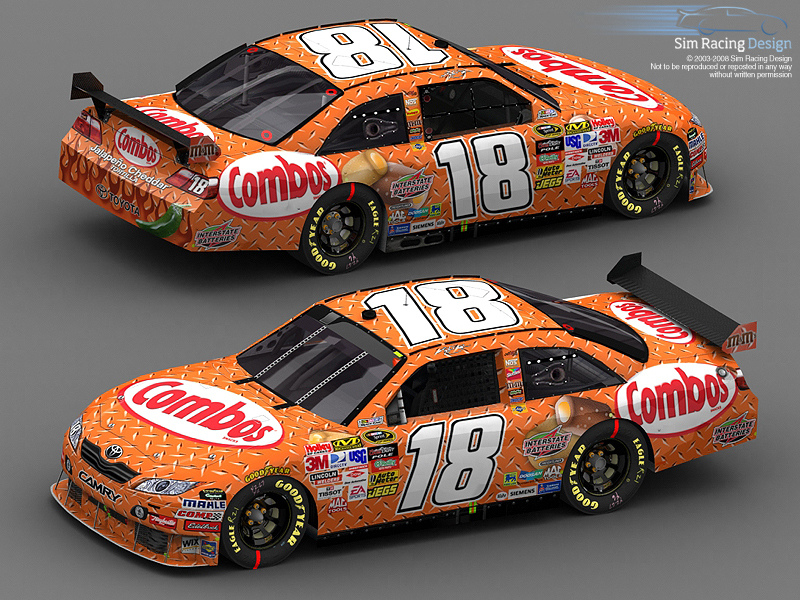 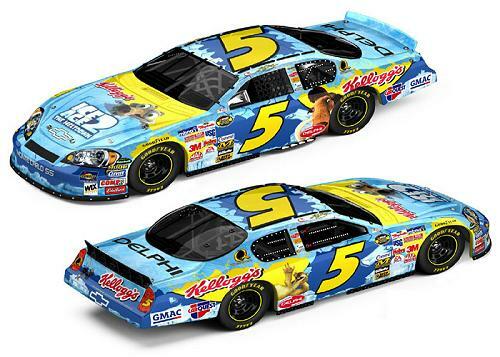 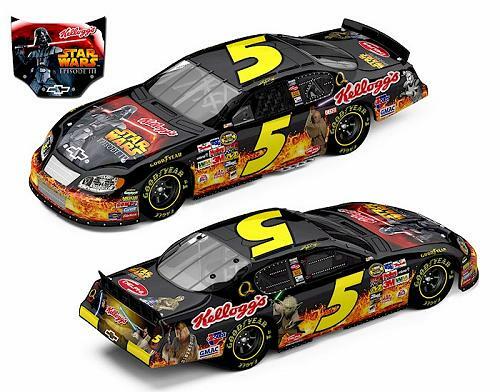 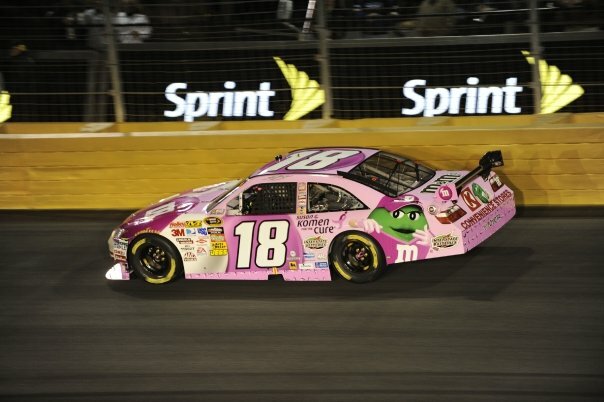 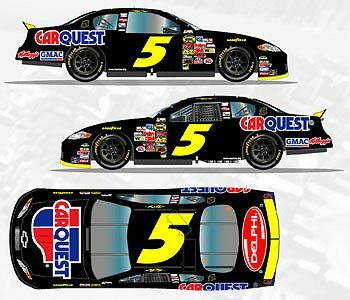 This car ran in the Sprint All-Star race at Charlotte. 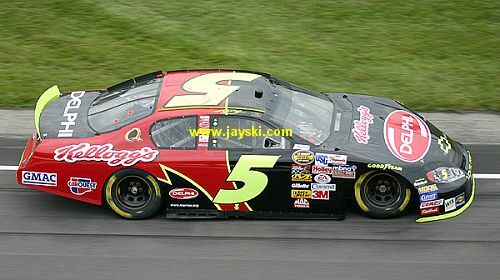 I can't tell what logo is on the back of this car, but it is not the Sam's logo. 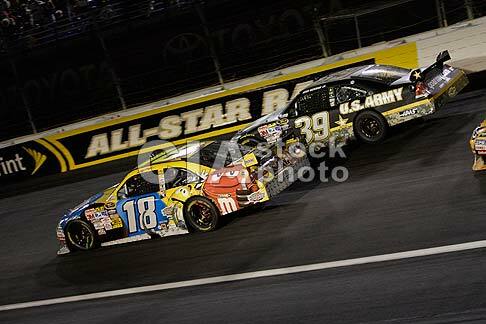 This car ran in the Sprint All-Star race at Charlotten. 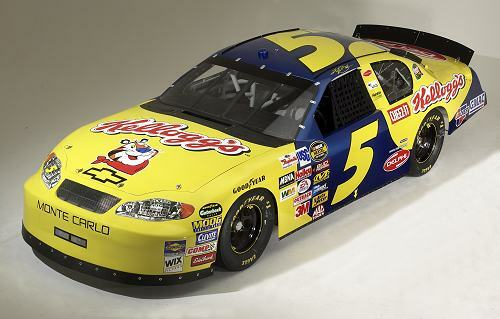 This car ran at the first Michigan race, the second Pocono race, and Watkins Glen. 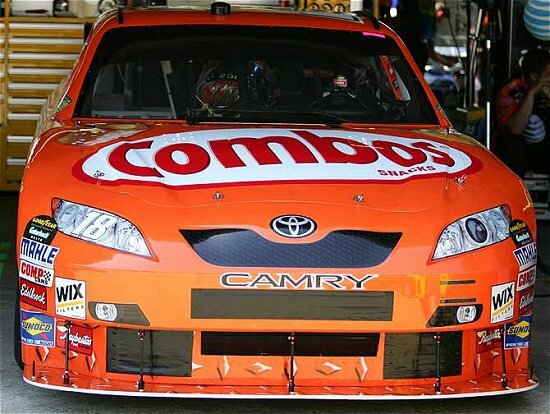 This car was driven at Infineon Raceway in June. 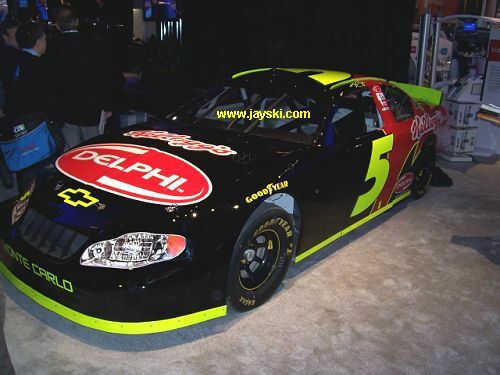 This car was driven at NHIS, second Dayton, and the second Dover race. 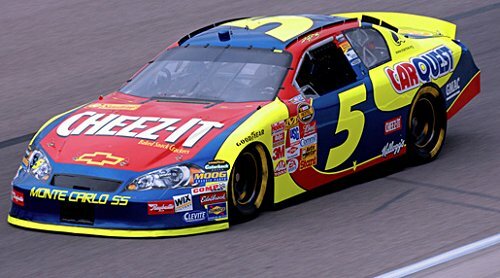 This car ran at the Chicago race. 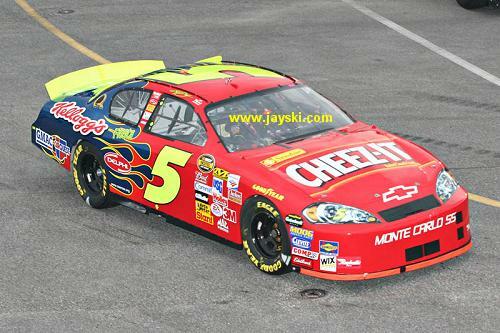 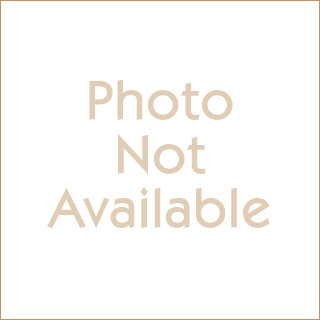 This car ran at the second Mighican race. 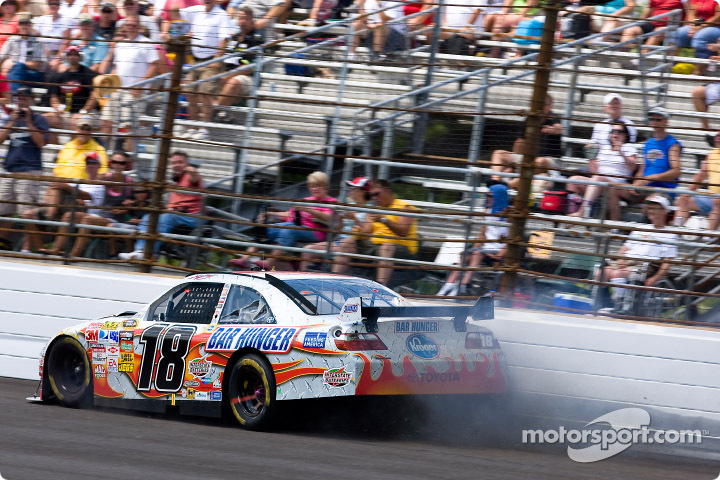 This car has the Kroger logo on the back. 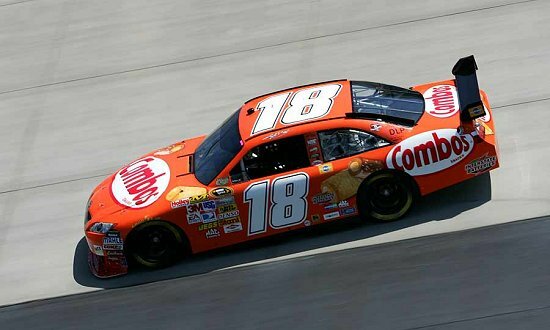 This car was raced at the second Bristol race. 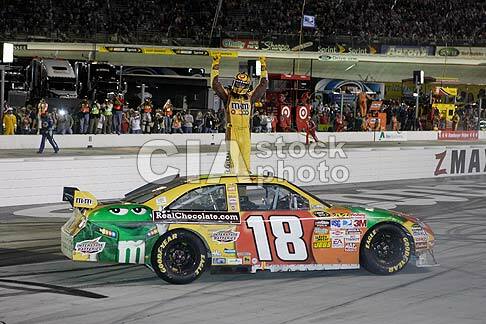 A view of Kyle in Victory lane at Bristol. 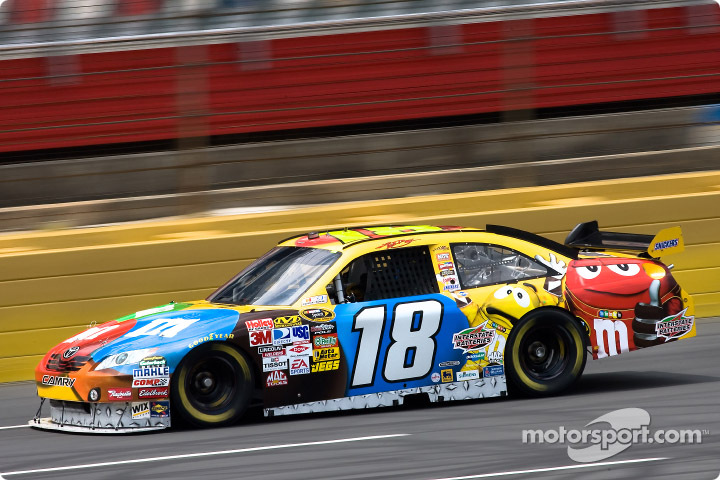 This car ran at the second Atlanta race. 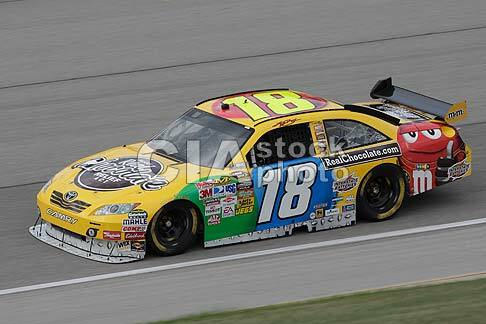 This car shows the Dollar General logo on the back. 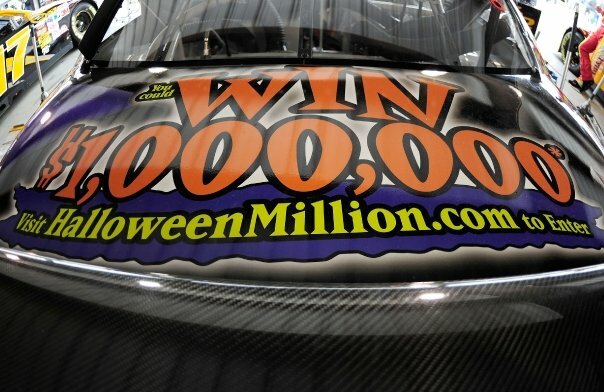 This car has the Twitter.com/RidinwithRowdy logo on the back shown below. 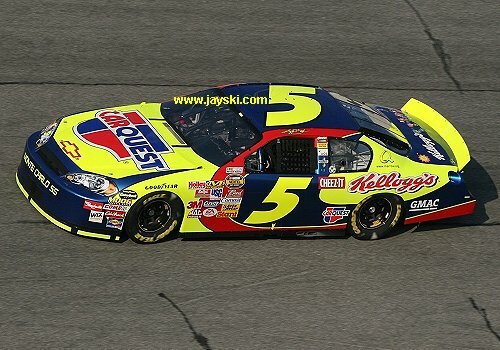 This car was raced at Kansas and the second Fontana race. 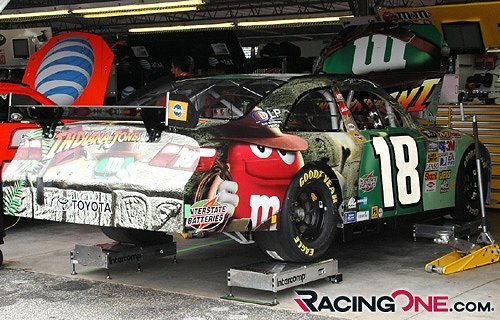 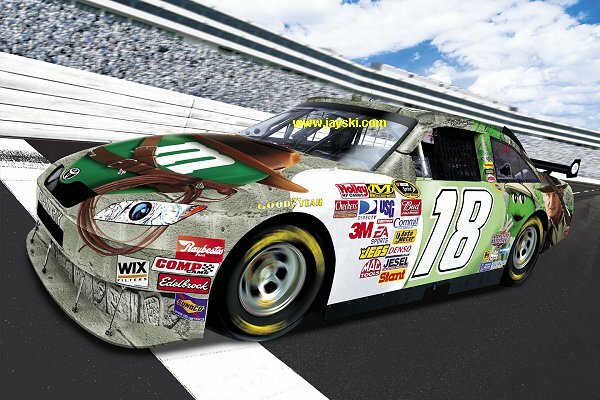 This car shows the Twitter.com/RidinwithRowdy logo on the back. 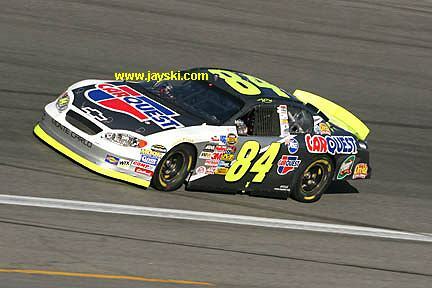 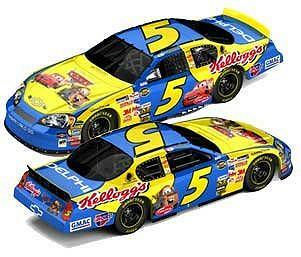 This car was raced at Kansas. 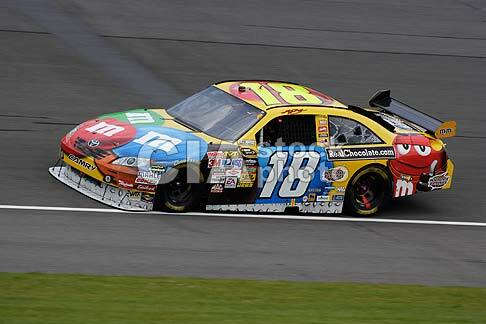 This car has the K Stores logo on the back. 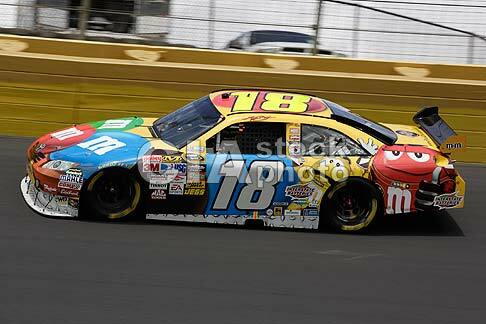 This car was raced at the second Charlotte race. 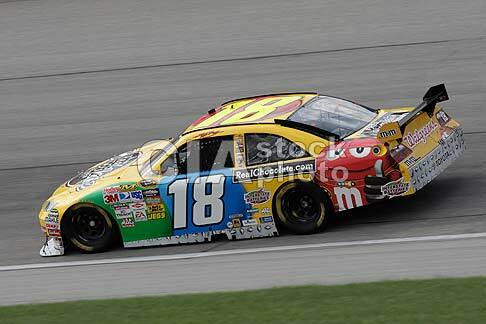 This car was raced at the second Martinsville race. 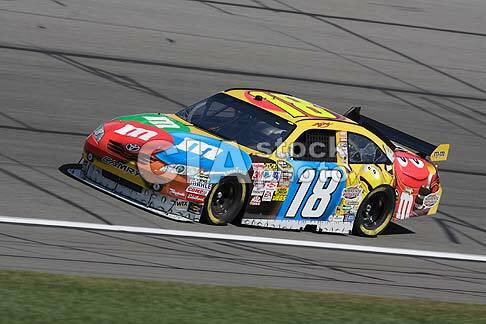 This car has the Valero corner store logo on the back. 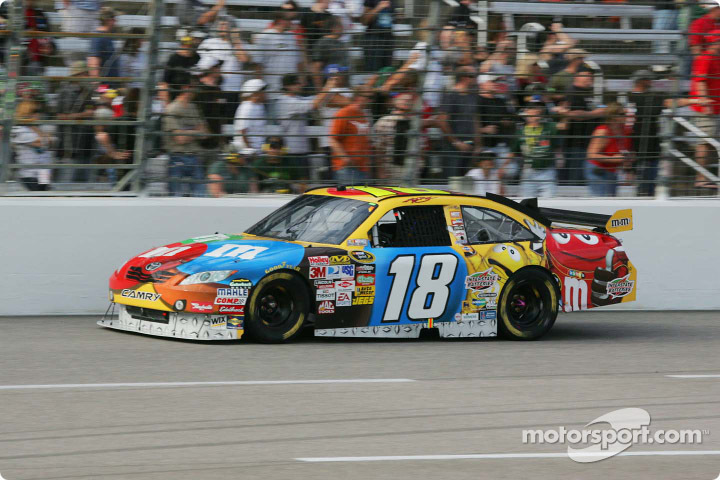 This car was raced at the second Texas race. 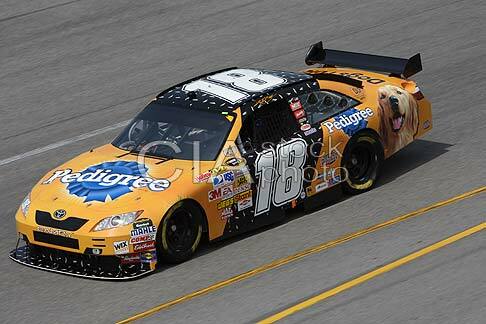 This car has the PetSmart logo on the back. 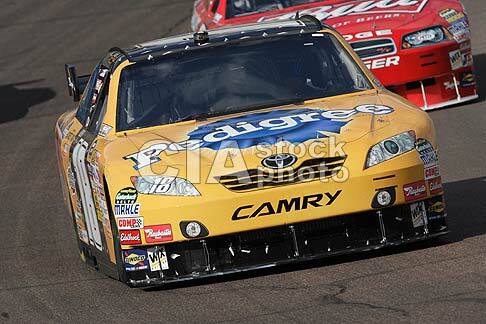 This car was raced at the second Phoenix race. 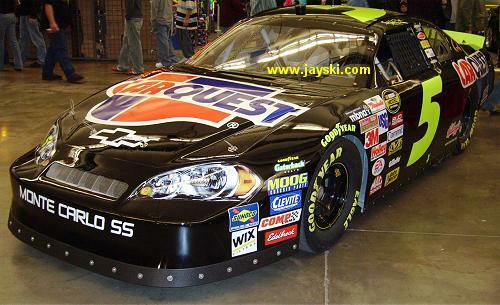 I'm not sure what logo is on the back of this racecar. 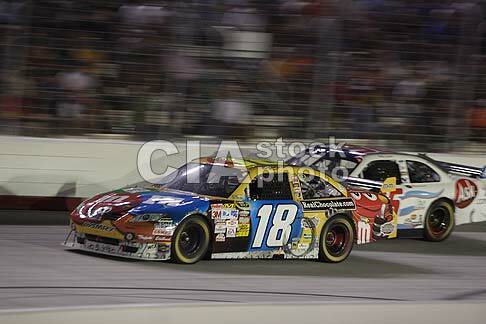 This car was raced at the last race at Homestead, Miami race.